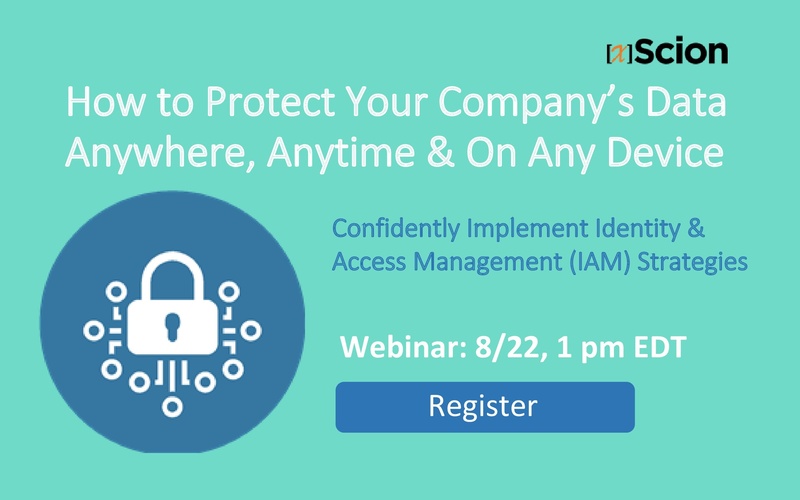 xScion Solutions announces webinar, How to Protect Your Company’s Data Anywhere, Anytime, On Any Device: Confidently Implement Identity & Access Management (IAM) Strategies. McLean, VA – July 26, 2018 – xScion Solutions (xScion), a technology consulting firm, announced today it is hosting a live, complimentary webinar on Wednesday, August 22 at 1:00 p.m. EDT called, How to Protect Your Company’s Data Anywhere, Anytime, On Any Device –Confidently Implement Identity & Access Management (IAM) Strategies. The webinar will be hosted by Mason Chaudhry, Principal of Delivery at xScion and Eric Anderson, IAM expert. xScion helps companies modernize their technology and operations with innovative Data Services, DevOps, Application Development and Agile Transformation solutions. In today’s digital world, customers and employees want immediate access to the data they need, on the device they prefer. They trust companies to keep their data private and secure. Yet how do companies offer a true data-driven customer experience without the data being compromised? Good data stewardship is the responsibility of an entire company – from the company executive to the technical personnel. This free webinar will explain how an organization can protect its data regardless of the ingress point. IAM expert Anderson will give executives and technical personnel alike the confidence to discuss architectural strategies, improve the virility of data and advance the customer experience. A real-world case study will explain how a large healthcare payer implemented access management strategies to empower timely access to data from any device, anywhere, at any time. For more information and to register for the webinar, visit http://info.xscion.com/webinar-iam.